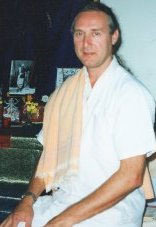 Babaji Bob Kindler began his formal spiritual training in Yoga and Vedanta in 1970 at the age of twenty. After more than a decade of spiritual austerities and extensive study of the scriptures in Eastern Traditions, he received initiation into the Ramakrishna lineage by Swami Aseshananda, a direct disciple of Sri Sarada Devi, wife and spiritual consort of Sri Ramakrishna Paramahamsa. He also received guidance and instruction from Swami Nityasvarupananda, another direct disciple of Holy Mother, and training in ritualistic worship from Swami Damodarananda, both of the Ramakrishna Order as well. Babaji's emergence as a teacher of Sanatana Dharma occurred naturally with the creation of Jai Ma Music, an acclaimed sacred arts ensemble which he founded in 1980 as a vehicle for the exalted teachings of India through wisdom-oriented devotional music. He also received encouragement from his friend, Lex Hixon, the instigating force and co-founder of the national SRV Association of the West, based in New York state. Throughout the 80's and 90's, Babaji and Jai Ma Music toured the United States offering concerts of bhajans and chanting, lectures, classes, workshops and seminars on the various aspects of Vedic Wisdom at temples, churches, schools and spiritual centers. Trained as a classical musician from the age of eleven, he also fulfilled a career as an instrumentalist, appearing as a professional soloist, accomplished chamber player, and orchestral cellist for 30 years. His classical training in Yoga, Vedanta, and the Fine Arts is reflected in his style of teaching at the SRV ashramas, where the profound Wisdom of India's perennial philosophies are effectively integrated with devotional and instrumental music from both East and West. Babaji's approach as a spiritual teacher blends a traditional, non-compromising foundation with personal realization, devotion to Guru and scripture, a deep reverence and concern for aspiring beings, and a special ability to access and transmit a variety of spiritual teachings, matching them to the needs of individual students. He teaches Vedanta, the Four Yogas, Tantra, Meditation, Buddhism and other systems of philosophy and religion emphasizing the Advaitic or non-dual standpoint. As Spiritual Director of the independent SRV associations, formed in 1993, Babaji visits the centers approximately three times a year. He leads up to four retreats throughout the year at various locations and offers group pilgrimage to India every two or three years. These occasions give participants the opportunity to experience in greater depth the transformative and transcendent quality of non-dual Truth. The retreats integrate knowledge, devotion, meditation and selfless service through study of scripture, chanting, introspection, worship, and holy company. These spiritual disciplines, engaged in within the proximity of guru and sangha, bring purity of heart and clarity of mind. This allows aspiring beings who are living in the world to withdraw into solitude, experience sacred communion with their inner Self, and focus on Divine Reality. An accessible teacher, students and friends can easily maintain personal contact with Babaji through email, letters, phone calls, private meetings, satsangs (meetings with sangha and guru for informal spiritual discourse), classes, retreats and group excursions. He welcomes novices, members of other religious paths, and all sincere seekers at the SRV centers. Personal initiation into the SRV Association and individual guidance in spiritual life is offered to those who accept the universal teachings in accordance with Vedanta ideals represented by Sri Ramakrishna, Sri Sarada Devi and Swami Vivekananda. All of Babaji's books as well as his music are available through our Online Store or please visit any of our SRV Centers.